China became the third country ever to launch a human into space in 2003 and has been expanding its space program ever since. Get the latest news about China's space program, launches and space missions. It's back to work for China's moon mission: The Chang'e 4 lander and the Yutu 2 rover both awoke over the weekend to start their fourth lunar day. OneSpace of China failed to become the first private launch firm to place a satellite in orbit after the loss of its OS-M1 solid launch vehicle Wednesday. NASA's Lunar Reconnaissance Orbiter continues to monitor the whereabouts and wanderings of China's Yutu 2 rover on the moon's far side. China launched its 300th Long March rocket mission March 10 with the communications satellite ChinaSat 6C. Everything is going well for China's Chang'e 4 farside moon mission, according to Chinese media reports. The world is still celebrating the historic landing on China's Chang'e-4 on the far side of the moon on January 3. Five sites on the far side of the moon have brand-new names, thanks to China's Chang'e-4 mission that touched down on Jan. 3 at a location now known as Statio Tianhe. The Chang'e-4 lander and rover entered sleep mode Monday in preparation for a second lunar nighttime on the far side of the moon. The 'dark' side of the moon isn't really darker than the 'light side of the moon. But it does appear to get colder at night. 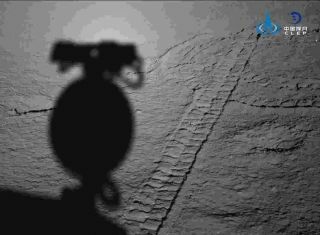 China’s Chang'e 4 lander and rover made it through their first night on the moon's far side, surviving temperatures that plunged as low as minus 310 degrees Fahrenheit (minus 190 degrees Celsius). China has built the world's first robotic, partially submersible boat for launching sounding rockets — a technology that will help meteorologists better understand the atmosphere over Earth's oceans. With other space agencies around the world making big plans for lunar exploration, will NASA be left in the (moon) dust? The cotton plants that sprouted on the moon's far side aboard China's Chang'e 4 lander are dead, done in by the bitter cold of the lengthy lunar night.